Spring Animal puppets are a powerful addition to any children's show and these notes will really improve your routines. 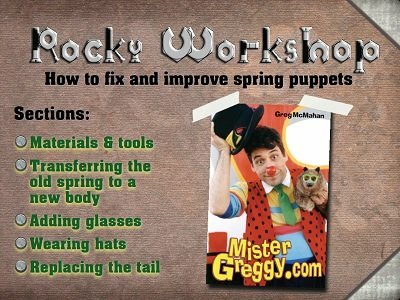 If you use a spring animal or puppet in your show (or plan to), this ebook is for you. Material & Tools you'll need: You're going to be working with leather, a metal spring, a tail and sewing. Here's the tools and materials used in the workshop. Transferring the old spring into a new body: Usually the outer "skin" wears out faster than the spring. You may also want to convert a different animal into a spring puppet. Here's how. Adding glasses: The key to puppets expressions are the eyes. Here's how to add glasses to give Rocky real character... and more. Wearing hats: Once the glasses are in place, you're ready to start adding hats and other costume elements. This shows you how and offers some great ideas. Replacing the tail: Sometimes you want to replace the tail on a new Rocky with an older one that looks really good. Here's how. Color photos on every page clearly explain how to customize your Rocky Raccoon puppet so it fits in with your show perfectly. 1st edition 2010, 25 pages.